Charlie Wood from Dropbox spoke about the need for technology to be unifying and above all simple so that people can instantly be in sync both inside and outside of an organisation. Dropbox see real time collaboration without boundaries as a key business driver. He also spoke about innovation and how 50% of all new ideas stem from Dropbox’s Hackweek initiative. Bruce Duyshart from Meld made the case for building owners to provide smart precinct technologies to enrich the user experience in just the same way as a smart workplace. His point was that the opportunity now exists to utilise I Beacons, Wi-Fi and work enabling street furniture so that people can co-create both outside and inside. David Rolls from Mirvac reinforced the value of this approach by detailing some of the initiatives that are going to be installed in Australia’s largest workplace and precinct project at ATP (Australian Technology Park) for the CBA – a project that we are proud to be part of. This story echoed the work we are doing to support Mirvac’s new HQ at 200 George Street where the seamless integration of smart building and workplace technologies is a critical success factor. This all begins by making smart phones the primary the portal for the user experience: pre-registration avoids a wait at reception and improves security, a wave across a NFC allows you to understand the story behind an artwork or archive and your room preferences are transferable so if you are there to present it’s all pre-set. Add to this real time utilisation and you have some very powerful data that can be used to really understand how the space is performing. We were asked by Phillip Ross from Unwired to think of the workplace as a “culture club”. His point was that workplaces will only attract the very best talent if they provide a superior user experience and mobile enabling technologies to suit the 5 generations currently in the workforce. He reminded us that we need acknowledge the Slashie Generation and their need for flexibility and blended project work. 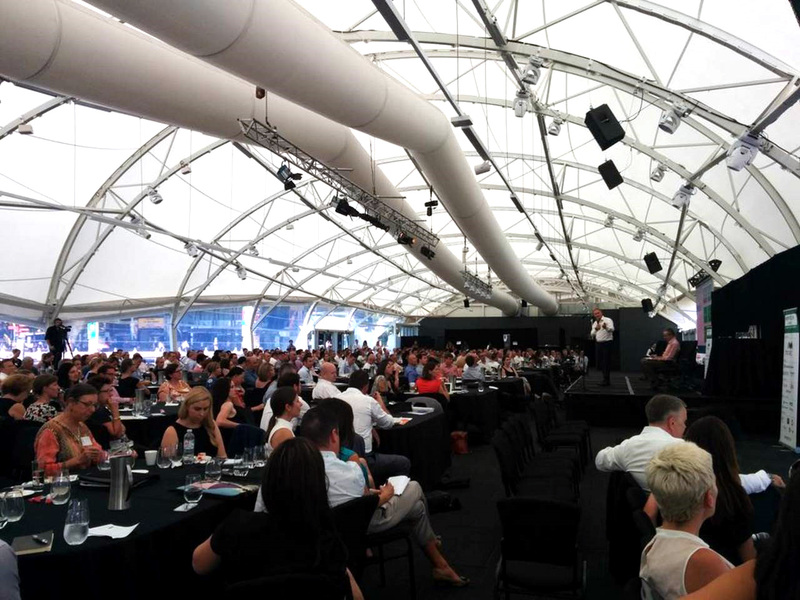 This message was reinforced by another speaker and client of ours, Nicole Birbas from Telstra, who shared with the audience the change journey and its fundamental role in reshaping behaviours in order to get people ready for work in their new space. Nicole made it clear that a new workplace methodology such Future Ways of Working will only be successful if there is strong leadership, a workplace policy that supports flex working and an effective change management approach. The proof was in the pudding with over 80% of Telstra personnel stating they preferred to work in this new dynamic way rather than their previous static and highly cellar workplace. She also mention the human health and wellbeing benefits of working this way. There is no doubt this year’s conference with its emphasis on technology reinforced that the workplace continues to undergo significant transformation as business owners continuously look for new and better ways to collaborate in both the physical and virtual world. This need being driven by increased levels of team based working, the prevalence of the agile working methodology and spaces for design thinking. All these themes are common to what we are experiencing in workplace design both in Australia and overseas as clients look to their workplace more and more as an agent for transformation. It was also personally satisfying to have our workplace projects so well represented at this conference.